There is a whole world of fabric out there. Last week I went fabric shopping with Tracey from Porchlight Interiors and got to visit all the secret designer fabric hangouts. It’s all pretty arcane with modest exteriors leading to an Aladdin’s cave of treasures, their own language (colour ways, colour story) and they all seem to know each other. Needless to say – I loved it! The fabrics available are unbelievably beautiful, and many of them are unbelievably expensive. $250 a metre???? Tracey kindly guided me to the more modest end of the spectrum where we found some lovely fabrics and I purposefully kept away Schumacher’s siren call. 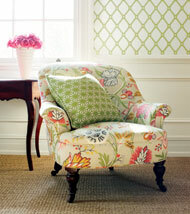 I particularly loved some of Thibault’s fabrics. Never thought I’d be a pink kind of girl, but I do love it with green. As well as price, there were a few other considerations. Firstly, as I’m the only female in a house of males, it couldn’t be too girly. So, no to pink and big florals. Secondly, it had to be kid friendly, so no white/pale coloured backgrounds. Finally, I didn’t want it to look formal. I want a nice, relaxed and comfortable look. This is what we ended up selecting (excuse the bad photography). 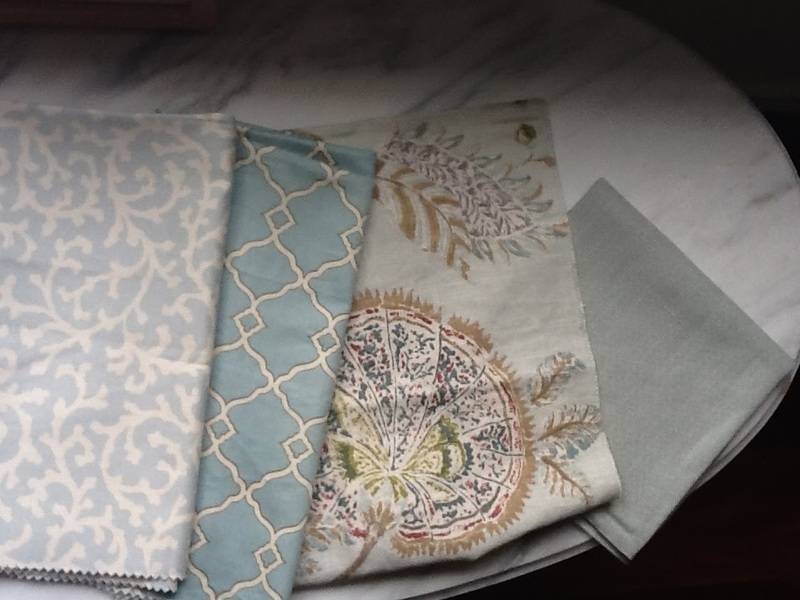 From left to right: Curtain option 1, curtain option 2, fabric for two armchairs by the window (sigh) and seafoam material for cushion. I ended going with Curtain option 2 as I thought the room would need an injection of brighter colour.